SANTA CRUZ COUNTY, Calif. -- A firefighter and his wife unexpectedly delivered their baby boy at the parking lot of a Santa Cruz County sheriff's building in Felton early Monday morning. 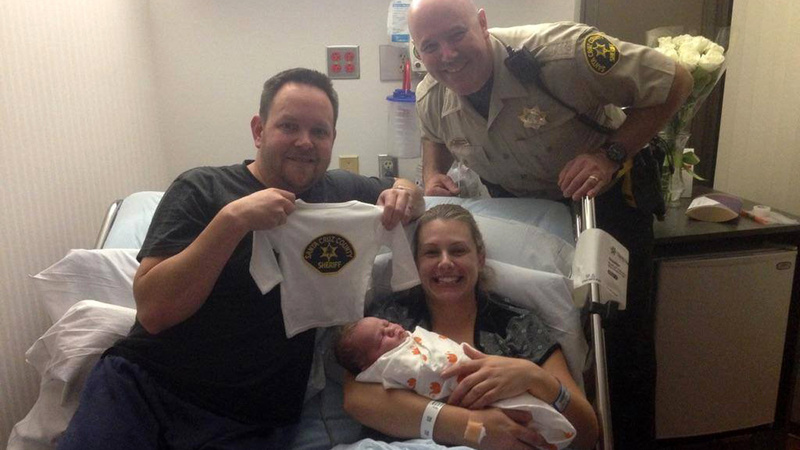 Charlie and Michelle Missman welcomed their healthy newborn Lucas Kristopher into the world around 3:30 a.m. outside the sheriff's San Lorenzo Valley Service Center at 6062 Graham Hill Road, sheriff's officials said. The couple is resting at Dominican Hospital in Santa Cruz with their baby, who weighed 8 pounds 7 ounces and measured 20 inches long, Michelle said. She started feeling contractions around 2 a.m. and her water broke about 45 minutes later. The couple left their Felton home around 3 a.m. and she told him to pull over about 2 miles into the trip. Charlie called 911 and parked at the sheriff's center, where he came around the car while on the phone with a dispatcher to help deliver their baby two to three minutes later, Michelle said. "I really had nowhere else to go and we happened to be there, but it was ultimately a good spot," Charlie said. Deputies working the graveyard shift assisted the family until crews from the Felton Fire Protection District and medics reached the scene, according to sheriff's officials. Charlie is a deputy fire marshal at the Presidio of San Francisco who has training in delivering a child, which Michelle said gave her peace of mind. "I trusted him to know what to do," she said. It took about three pushes before Lucas came out. In the final push Charlie was able to remove the umbilical cord that had been wrapped around his son's head. "I was worried about the cord wrapped around his head. He wasn't adequately breathing at first," Charlie said. Lucas was limp, blue and not breathing when he came out of the womb, according to Charlie. "Once he started crying a little bit things got a lot better," Charlie said. Firefighters were able to cut the cord and provided Lucas with oxygen and wrapped him up in towels, Michelle said. "Honestly one of my first thoughts was I can't believe I delivered my baby on the side of the road," she said. She and her husband were thankful for the help and quick response they received from the deputies and emergency crews. "Everyone came together to help keep us calm," she said. The couple also has a 2-year-old son who's staying with his grandma for the night, Michelle said. Felton Fire Protection District Chief Rick Rickabaugh was one of four responders to this morning's delivery, which was initially called in as an "imminent child birth" with the head crowning. The firefighters reached the parking lot within minutes to learn the child had been delivered and assisted in caring for the baby and mother before an ambulance arrived, Rickabaugh said. The district's firefighters have assisted in other births that happened at a much faster rate inside homes, but it was Rickabaugh's first time responding to a delivery at a parking lot. The sheriff's service center is near one of the busiest streets in the community that runs into Santa Cruz, according to Rickabaugh. There could've been many hazards in the delivery, but Rickabaugh was thankful that there were no complications. "Once the umbilical cord was cut our first priority was checking on the baby and making sure that he was warm," Rickabaugh said. Another concern the firefighters had was the temperature, which was in the 40s but Rickabaugh didn't consider it to be freezing conditions, the chief said. The baby had a "good cry" while the mother "had a big smile and was quite happy," according to Rickabaugh. "She looked remarkably composed and not like she had been through hours or days of labor," Rickabaugh said.